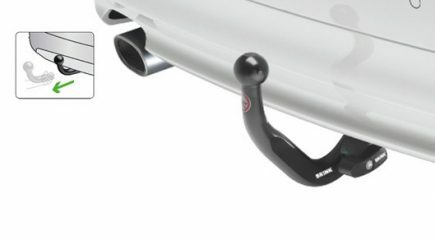 Once you have installed a towbar on your car, you have the option to attach additional accessories in order to increase safety and ease of use. Below is a list of several possible accessories. 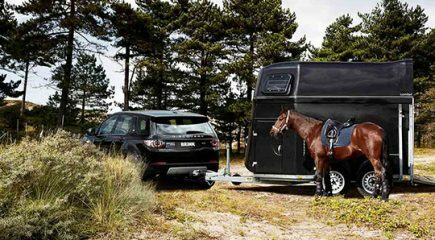 You can do more with a towbar than just attaching a trailer, caravan, boat trailer or horse box. It also offers additional options to carry cycles or more luggage on your holiday trip. Easily the best-selling add-on for a towbar is the bike carrier. It is the easiest way to transport your bikes. Nowadays, attaching a bike carrier on your towbar takes no time at all. Luxury versions can even be tilted back bikes and all, to allow access to the boot of the car. A bike carrier does not result in wind noise and additional fuel costs. The structural design ensures it does not catch the wind very much, which is a strong advantage over transporting bikes on your roof. 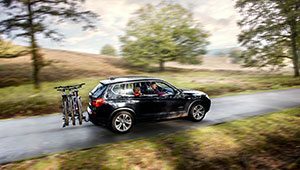 In addition, the use of a bike carrier does not incur speed limitations, even if you select a bike carrier that can transport up to four bikes. In that case, please pay close attention that you do not exceed the maximum nose weight. There are two ways to secure your bike on the carrier: attached to the peddles or to the bike frame. When securing at the crank (the axle of the pedal), your bike is placed in a plastic clamp. It may be that your crank will not fit in the clamp, or that the shape of the crank makes it impossible to secure it. Attaching it to the frame is the alternative. This type of bike carrier has a stand that is secured to the frame or seat tube of the bike. The arm is adjustable, ensuring it can fit any bike. If you are travelling and need additional luggage space, a towbar cargo box could be the solution. This large case can be attached to your towbar, giving you more space to store luggage in a place that is more easily reached than a roof box. In addition, a towbar cargo box catches a lot less wind, resulting in your car being more energy efficient and less noisy. Towbar cargo boxes are especially popular with owners of convertibles. The boot of this model of cars offers little space and it’s not possible to fit a roof box. 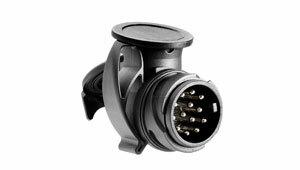 The plug of your wiring kit does not always match the socket of your car, as not every plug is the same. This means that one plug might have seven pins while another may have thirteen. If this is the case, you need a plug adapter, with which 13-pin plugs can still connect to a 7-pin socket and vice versa. The Brink towbars and wiring kits have, of course, been extensively tested and meet all international guidelines. In order to ensure additional safety, we recommend the following accessories. When you are loading a trailer or caravan, you need to take nose weight into account. This is the pressure applied to the towbar. To ensure optimal security during driving, it is very important that the nose weight is properly regulated; it is different for every vehicle. You can use a nose weight gauge to simply measure the nose weight in kilos. This is certainly an essential accessory. If you want to tow a caravan or trailer, you should always attach a breakaway cable to the towbar of your car. Often the towbar has a hole where the snap hook of this breakaway cable can be attached. With a Brink towbar, this so-called fixing eye is always attached to the ball plate. If this coupling point is missing, you can purchase a secondary coupling which you can easily install on your towbar. Using a secondary coupling, you can easily and safely secure the breakaway cable with a loop. In most cases, if you have a bike carrier or towbar cargo box mounted, you will need to attach a license plate, similarly to when you’re towing a trailer, caravan, boat trailer or horse box. You can order one through your garage or online. Do you like cycling, but is your car not allowed to tow trailer weight not allowed to tow trailer weight ? The Brink bike carrier towbar might be the answer to your problem.